We offer Vapor Blasting (also known as wet blasting or liquid honing) on all Non-Ferrous Metals and plastic. Vapor blasting is a non-aggressive surfacing process that provides a high-quality finish even on delicate surfaces. 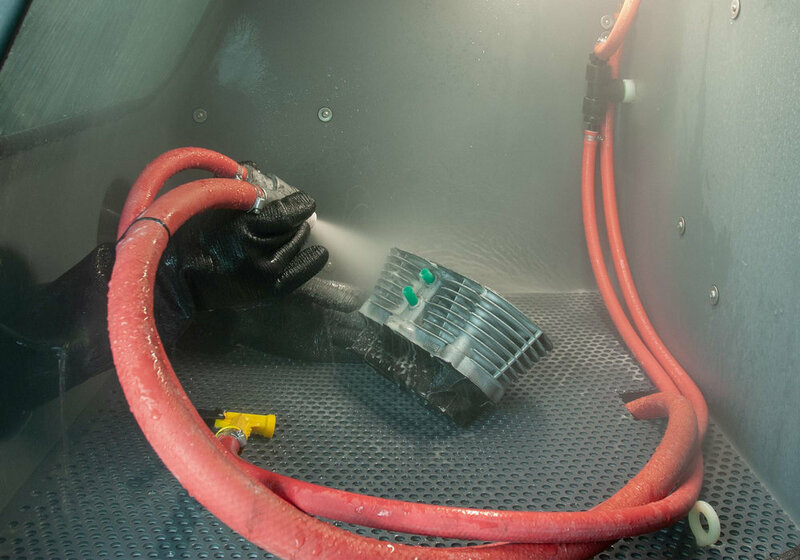 Vapor blasting can remove dirt, contaminants, rust, corrosion, and old paint while gently cleaning the surface. All parts are inspected, degreased and cleaned prior to vapor blasting. We plug and mask off as needed, protecting areas like inserts or liners. All steel studs, bearing surfaces and other needed areas are treated with protectant to help prevent rust. Additional steps, including light sandblasting may be needed depending on the surface condition. By combining one of our specifically developed non-aggressive medias with water, we are able to remove rust, corrosion, and surface imperfections from a wide range of surfaces. Because water helps cool the surface, it is ideal for aluminum and stainless. No media is impregnated into the surface. The surface finish will depend on the metal and media used. Die cast aluminium will have a satin finish while sand cast parts will appear bight and clean. Parts are triple rinsed, air dried, and inspected for media before a final rinse and air dry. A coating of surface protectant may be applied along with anti-corrosion coatings to steel surfaces. Parts may also be ultrasonic cleaned if needed. Cerakote and other coatings available.